CHI (Qi) or PRANA is a form of energy, which in our body comes from several sources. Chi (Chin. qì, tsi, Ch'i , Chee; Jap. : Ki ; Korea : Gi) means roughly 'Clear purity'. In the lower planes it is impregnated with impure Maya (dark chi) of the buddhic pranava. The tibetan equivalent is (r)Lung. In the kabbalist Sepher Jesirah the word 'Chi' is translated with 'life'. According to Daoist view, Chi permeates the entire universe (qihai). The world originated from the original Qi (Yuanqi, Heavenly Qi), in which Yin and Yang were still mixed. Heaven and earth were formed only by the separation of the One Tao: That what Yangqi received rose bright and clear and became heaven, that which Yinqi received became dark and heavy and sank to the earth. Man in the middle should keep yin and yang in a balance. 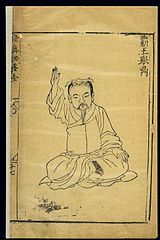 The Daoist tries to cultivate the Chi through Qigong exercises and with the help of Tai Chi (taiji, short for t'ai chi ch'üan (taijiquan) exercises. In Chinese medicine, up to 43 species of chi are distinguished. The most important are Yuan-Qi (Original-Qi), Zong-Qi (Breath-Qi), Ying-Qi (Food-Qi) and Wie-Qi (Defense-Qi). The Yuan-Qi is also called innate-Qi, while the respiratory and food Qi is referred to as acquired Qi. The undeveloped person gets CHI mainly through the food as Gu-Qi and by the breath. He transforms body - related forces such as the Prana - Kundalaini and his sexual energies into vital energy. Therefore, the many types of breathing are understandable for beginners. In chinese breathing therapy (for this, Prof. St. Palos: Breath and Meditation - Chinese Respiratory Therapy and Scientific Measurements, Bern: Scherz, 1974), the breath is also used together with certain healing mantras or healing syllables. Ordinary CHI comes mainly from the sun to the earth. Different substances can store this energy or aspects of this energy. In particular the plant kingdom is constantly exposed to the sun as well as the air. Chi circulates in the average person in the so-called etheric body, of which Chinese medicine is familiar with the acupuncture system. Animals also have an acupuncture system. As the student progresses, CHI forms a cycle that expands. 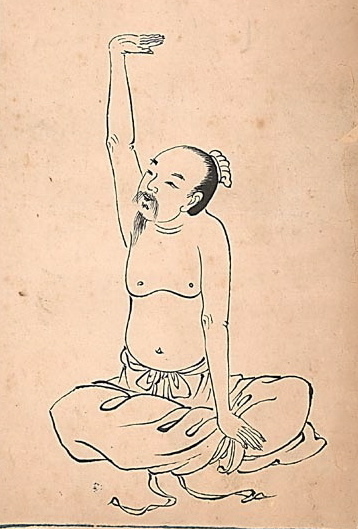 The chinese Qi-Gong practices and many Taoist meditations focus on this cycle. (Mantak Chia : Awaken Healing Energy through the Tao ; Alice A. Bailey : A Treatise on White Magic, pg.74 [Online] ). Depending on the path taken, this Chi can later lead to certain abilities and also healing powers, but this is especially not advisable for beginners, since a stressful karmic bond to the patient can occur, and in addition to capturing dark chi also a transmission of infections. Dark CHI can lead to disease. By certain forms, CHI can also be transformed into constructive and destructive forms. This is the basis of the chinese Feng Shui. The average man converts the solar prana into dark CHI, and he is therefore a "sinner" who transforms the energies down. In unventilated rooms, in production halls, in city centers with large crowds of people, in discotheques and in different places with crowds of people with low desires and wishes as well as in dance clubs etc. dark Chi is to predominant. It is produced there quite naturally. Alsorotating machines and burnings set different kinds of chi free. From this the sense of prayer mills derives. The student should therefore strive for a pure life, avoiding such things and learn to shield and protect the chi. Also the yogasystems teach 5 Pranas: Prana, Apana, Udana, Samana, Yyana. In this context the yoga also knows the five Vayus (Sans. Vāyu, wind) of the 5 lower chakras and the 5 Vatas, which are manifestations of the Vata-Dosha. In the Ashtanga Yoga, step 4 (or 7 and 8 of the Universal Path) is the Pranayama, ie. the mastery of prana or chi. The white Magician Franz Bardon s poke of magical energy accumulation. The word 'Lung' (Tib. རླུང rlung) means wind or breath. It comes from Tibetan Buddhism and is important for understanding the subtle body and the three Vajras (body, language and spirit). However, it has a number of meanings and especially in Tibetan medicine. The Vayu and the Prana of Ayurvedic Medicine, which was integrated into Tibetan medicine. Only the yuanqi (heavenly chi), that originated from the Tai chi and Jing, can be equated with spirituality,. According to the Saivagama, Prana is not something alien to samvit (consciousness) but its first development (Prak samvit prane parinata). The life force is here called pranana or prana-shakti. True spirituality begins first on the seven big initiations. The highest Chi in the Tapoloka corresponds to the 'ududdha pranava' of Yoga. The highest aspect of ethereal Chi on the buddhic plane is similar to the AUM-Pranava, which descends into Prakriti.